with feathers and fresh flowers. If there is one thing most gentlemen are able to appreciate, it's tradition and I am currently in the Austrian Alps where, as in the rest of the country, traditions are strong. 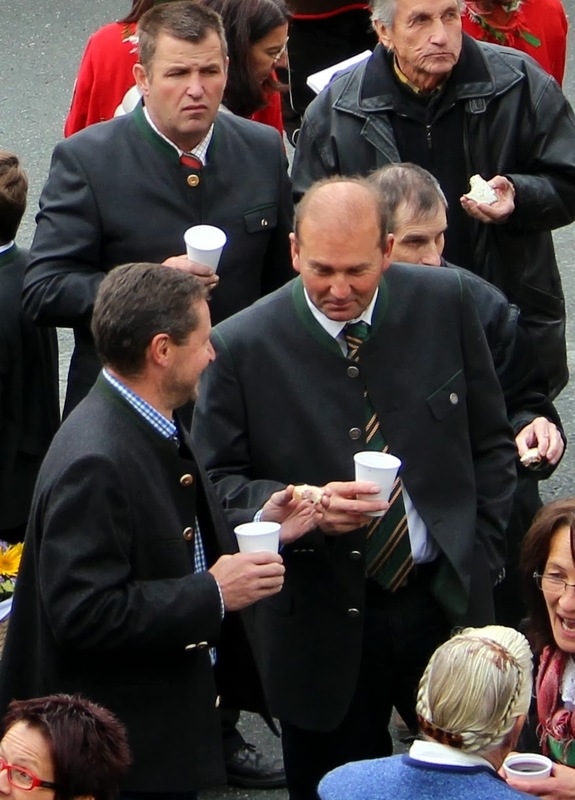 Yesterday I took part in one of the early autumn celebrations, "Erntedankfest". On the first Sunday of October each year "Erntedankfest" is celebrated, which is the celebration of a well completed harvest where thanks are given for all the produce the harvest has brought. The celebration will vary somewhat depending on where in Austria you are and the celebration are, of course, larger in the bigger cities than where I am at the moment in St. Lorenzen in Lesachtal. St. Lorenzen is only a small village with no more than about 400 inhabitants, situated approximately 1200 metres above sea level in the Carnic Alps. It's a place which offers great opportunities for nature experiences and the valley in which the village is situated, Lesachtal, is full of similar villages which each are worth a look around. The basilica in Maria Luggau is well worth a visit. If you would like to come here there are several options for accommodation in St. Lorenzen and in the neighbouring villages in Lesachtal, all of which receives great reviews online. The days starts at eight o'clock with the band playing. The day starts at eight o'clock in the morning with the brass band playing in the village centre. People gather around to listen to the music and to the priest giving his blessings and praying for the harvest. After this the band starts playing again and the priest leads the procession from the village centre to the church where mass is held. Some of the children are carrying small baskets with fresh fruit and vegetables to mark the occasion. While the majority goes to mass, some prefer to do it differently as you can see in the photo below of several of the band members taking a break outside. Some of the band members taking a break while others go to mass. During this time you can also see band hats and instruments lying around like decorations on the lawn. The hats and instruments make nice decorations on the lawn. After church the band starts up again and all the people gather outside where cakes and sandwiches are served together with glühwein for the adults and warm juice for the children. The celebrations continue with music, food and drinks. As per usual for this blog I will, of course, say a few words about what people are wearing. This is no different from anywhere else in the respect that some people dress up and some don't, but there is one thing you will always see at any Austrian celebration and that is the traditional costumes and jackets. The band is very traditionally dressed with lederhosen, knee high socks, buckle penny loafers, red wool jackets, a decorative scarf over the shoulders, and a had beautifully decorated with feathers and fresh flowers. For the others, the predominating colours are different shades of brown, grey and green. Although you see jacket with notch lapels, often with the collar in a different colour, the most common design are Nehru jackets with a band collar, also most commonly in a contrasting colour. The photos below show examples of this. What the different jackets have in common is that they are all may from thick, durable, wool fabrics and the buttons are almost always made from deer antlers. Traditional jackets in Nehru design with band collars. Band members in very traditional dress. Finally, I would like to end this post with a photo of the lovely band hats with the slightly cloudy Alps in the background. Take a trip up Lesachtal if you get the chance, it well worth a visit. The band is playing with the Alps in the background.